One of the best positions in Port Douglas. 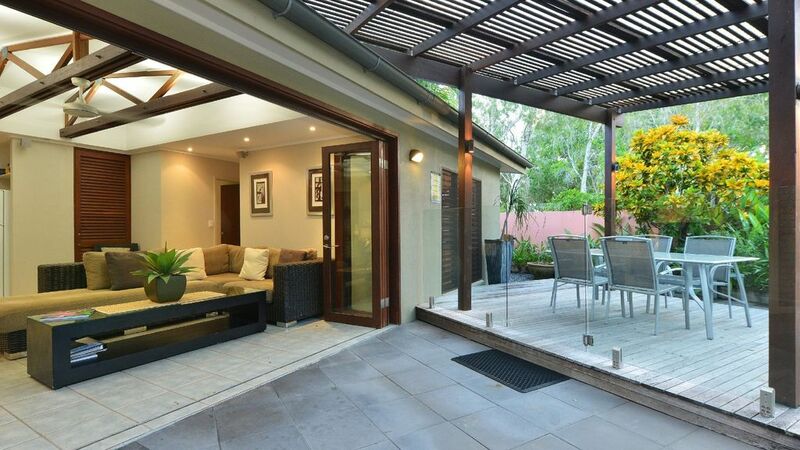 Cassowary Villa 1 is on Garrick Street, a two minute walk to the northern end of Four Mile Beach and a five minute walk to Macrossan Street. One of two villas on the block, Villa 1 is fully self contained with its own private swimming pool and garden. Contemporary colour in the villas and gardens provide a relaxing visual focus. The open plan kitchen services both front and back dining areas. The kitchen is furnished with quality appliances. Fully stocked cupboards provide all the china, glassware, cutlery and cookware you could need during your stay. The master Queen bedroom overlooks the pool. The en suite features an enormous Balinese style open shower with pebble floor detail and wooden louvers. A second Queen bedroom and third bedroom with Twin Singles share another contemporary bathroom. Both bedrooms have an outlook over the tropical garden. The swimming pool is heated during the winter months. The pool has a waterfall feature and beautiful back-lighting for tropical nights. Decor throughout the property is a combination of wrought iron, timber and rattan with selective colour highlights, reflective of the tropical landscaping. There is full air-conditioning as well as screens and fans throughout the villa to make your stay more comfortable. Entertainment includes a flat screen TV, DVD, CD Player and Foxtel and WiFi internet access. The Cassowary Villas are a great choice for families and car hire is not a necessity, the local supermarket is a ten minute walk away. Directly opposite the villas is a large reserve with basketball and tennis courts. For your security, these properties are managed in Australia and we never request that payments be made to overseas bank accounts. Come stay at Port Douglas, one of the most sought after holiday destinations in the world with the most beautiful natural attractions. This location is the closest mainland departure to the country's famous Great Barrier Reef!